The same economic factors that have caused wars have also caused revolutions and national liberation movements. Mass unemployment has stimulated the rise of revolutionary working class movements. The exploitation of poor colonial and neo-colonial countries has produced movements for national liberation. Both of these often take place in the ruins of capitalist countries following the devastation of inter-imperialist wars. At one point, to many observers, socialism seemed on the way to construction a world economic system that seemed not to need war. Although the socialist countries were born through revolutionary and national liberation wars, and although they were forced to defend their revolutions militarily against invasion and attack, they avoided many of the intrinsic causes for war. Their economies were not characterized by over-production and structural unemployment. In the relations among socialist countries, there was no imperialist exploitation. To the contrary, the net flow of wealth proceeded from the richer socialist countries, toward the poorer ones(footnote 11). 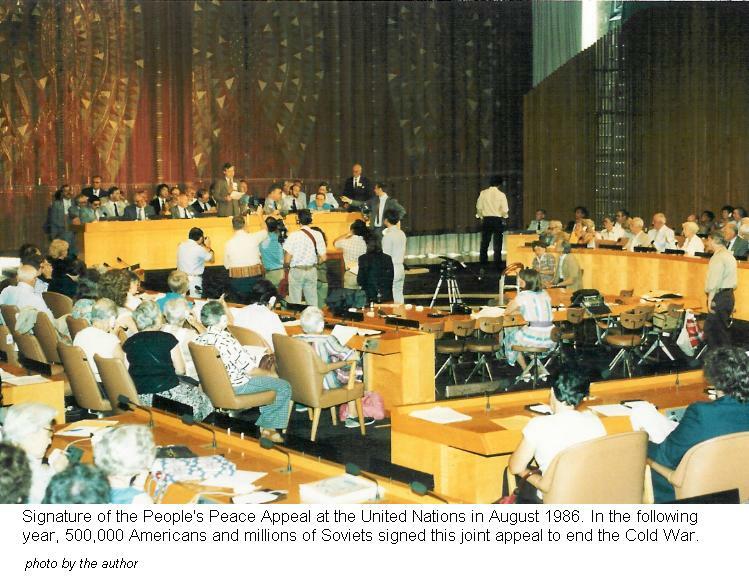 Signature of the People's Peace Appeal at the United Nations in August 1986. In the following year, 500,000 Americans and millions of Soviets signed this joint appeal to end the Cold War. Although the first edition of this book maintained that the socialist countries had escaped from the burden of a military-industrial complex, that turned out to be in error. The world was shocked at the end of the 1980's by the economic and political collapse of the Soviet Union and Eastern Europe. The collapse was caused by the overburdening of the Soviet economy with military production. Attempts to reverse the declining economy with conversion from military to civilian production were resisted by the Soviet military-industrial complex. Eventually the economy crashed and the political system collapsed on top of it. The Soviets had tried to match the West in terms of military production, but based on an economy only half as powerful. Therefore, they were forced to invest a percentage of their science and technology that was twice as great as that of the West in their military industry. It has been estimated that 85% of all Soviet scientists, engineers and skilled workers were invested in military production, including those with the most skill as they could command higher salaries in the military sector. By the end the Soviet economy could not produce any industrial goods of sufficient quality to export except for military and related aerospace products. Computers, machine tools, automobiles, electronic goods, clothing, all suffered from the diversion of technology, labor and raw materials to the insatiable arms race. In today's global market it is only a matter of time before such a system crashes. The immediate effects on world peace were contradictory. On the one hand, Gorbachev and others managed a transition without repression and war, unlike what had happened after the collapse of Germany 60 years before. And major disarmament agreements were made with the West. On the other hand, the loss of socialist perspectives in the United Nations gave the West a free hand to use the UN for war-making in the Persian Gulf. And the loss of socialist support for national liberation led to defeats of progressive movements around the world.